Lynn Serafinn looks at the hidden cost of modernisation, and the underlying Disconnection causing us to exploit, rather than harmonise with, the Natural world. About 20 years ago, I saw a documentary about Hawaii (if I remember correctly), where they interviewed an indigenous woman about how her people made their traditional straw hats. She showed how they gathered the straw by foraging, walking through the brush to find a plant with nice, ripe stalks. Then, very carefully and delicately, they would collect only a modest amount of stalks from that plant. Then, instead of cutting stalks from other plants easily within reach, they would walk a short distance away. When they felt they were far enough away from the plant they had just cut, they would look for another plant from which to harvest more stalks. They continued this process until they had enough straw to begin making a single hat. As this process took considerable time, you might wonder why modern Hawaiians didn’t try to find a faster way to get the job done. But the woman explained that this slow process was used in order to ensure the local eco-balance. By harvesting only a few stalks from each plant, and making sure not to forage from plants too close to one another, the plants would recover quickly and without trauma. She explained how living in harmony and rhythm with Nature was integral to their beliefs. And, by respecting and caring for the plants, they were also protecting future supplies of straw for the local people. The hat-makers’ practice is an example of how sustainability can underpin the belief system of an entire culture. Here, sustainability is not an academic argument or a social obligation arising out of hardship, but a beautiful dance between culture, the environment AND the local economy. I got curious to see if I could find out more Hawaiian hat making. Unfortunately, I couldn’t find anything except for adverts for cheap imitations on eBay! But, as I searched online I stumbled across a wealth of historical material on the so-called ‘Panama Hat’. I say ‘so-called’ because the Panama hat actually originated in Ecuador, becoming associated with Panama when they began to be exported through Panama in the mid-19th Century. While harvesting straw is a slow, careful process in indigenous culture, the hat-making is even slower and more careful. I found a small US-based Fair Trade company and non-profit organisation that supports traditional hat weavers in Montecristi, Ecuador. These weavers work in their homes, without any modern equipment. They do not produce thousands or hundreds of hat each year, but rather only a handful. In fact, the master weaver in Montecristi produces only FIVE hats a year. Unlike factory-made hats, these are so finely made they can last a lifetime. They are even said to be able to hold water! Today, the high craft of hat weaving has all but died out, due to mass production. Two historical events caused took traditional hat making from the weaver’s kitchen into the factories: first, the California gold rush in the 1850s and, later, the Spanish-American War, which dominated the last few decades of the 19th Century. Straw hats were quickly adopted by Anglo-European descended Americans who needed a way to protect themselves while spending many hours a day in the intense sun. There was no way to supply straw hats to whole armies of soldiers or thousands of fortune seekers if a handful of master weavers were producing fewer than ten hats a year. With time, big business was to take over tradition using lesser-skilled people, lower quality materials and less quality control. The results were more hats that ‘cost’ less. But did they really? Hold that thought and we’ll come back to it. The physical conditions of the west-coast countries are such that for an indefinite period in the future development enterprises will be necessary in order to utilize their natural resources. Railways are to be built, mines opened up, and public works constructed, so that the commerce is not simply the stationary one of supplying the settled wants of a fixed population… the lateral valleys, the intermountain plains, and the mountains themselves, which are the storehouses of mineral wealth, are all to be exploited… [emphasis added]. How vividly the wording in this report illustrates the profoundly different attitude early 20th Century American government (and capitalists of the era) had towards the natural environment, as compared to that of the traditional hat-makers. To me, the use of the word ‘exploited’ infers a fundamental difference in outlook. We can only exploit those things (or people) from which we feel separate and to which we feel superior. In ‘7 Graces’ terminology, this perspective arises from the ‘Deadly Sin of Disconnection’. In this case, we are especially talking about Disconnection from Source and Disconnection from Others. From such Disconnection, the big business of straw hat-making was born. Forget about foraging for the best straw; let’s grow and harvest whole crops of straw. Forget about small, tight weaving that will last a lifetime; let’s just get those hats made and distributed. Instead of preserving a master skill and teaching it to younger generations, let’s hire lots of unskilled people, pay them a pittance, and produce hats (and many other products) in the thousands or even millions. And lastly, let’s give the illusion these hats are ‘cheaper’ than their traditional forerunner. …that our urban culture operates upon the mythology that modernisation brings greater prosperity. This myth has caused many cultures around the world to abandon the old model of the sustainable village for the promise of industrial prosperity. Our notions of industrial prosperity are creating a false economy. Yes, factories may create more ‘jobs’, but the factory culture decreases the number of craftsmen. With the death of the craftsmen, we not only lose our culture, we lose our social consciousness. We lose quality. Falsely believing factory hats are ‘cheaper’ than traditionally made hats, we happily buy 20 shoddy hats in our lifetime instead of one, nice hat. We become a Primark or Walmart culture, where spending is endless, and waste is rife. We lose pride in ourselves. We lose economic self-reliance as we become dependent upon others for our income. But most of all, we lose our Connection to Source and our Collaborative relationship between our economy and our ecology. And when THAT happens, we have lost our true prosperity–the wealth we might call our ‘eco-capital’. The progressive distancing from nature that has taken place in recent decades is one reason why so many people switch off when they hear about environmental issues. And when they do so, the chances of getting the changes needed to maintain what nature does for us goes down. This is another reason why we need to invest more effort into getting people into contact with it–to literally connect with the Earth (pages 264-5). NOTE: Tony Juniper will be my guest on ‘The 7 Graces Hour’ this Wednesday April 10th at 6pm UK time (1pm EDT) on BlogTalkRadio at http://www.blogtalkradio.com/lynn-serafinn/2013/04/10/ep186-what-has-nature-ever-done-for-us-with-tony-juniper. The show will be replayed on WMRN at 9pm Eastern on Thursday April 18th at http://wmradio.ca/7graceshour. You can also catch it on demand after the live broadcasts at the same links. In describing our Disconnection from the Earth, Tony uses the analogy of financial capital and dividends. He says that anyone who understands economics knows that economic ruin is inevitable when we dip into our capital rather than living on the dividends of our investments. He cites the credit crunch and subsequent economic crash of the past decade as an example of how this transpires. Living in balance with the pace of Nature also creates sustainable communities and resilient local economies. Looking at it this way, we can more easily see the error in our thinking that modernisation has created prosperity. What is the value of monetary profits without these ‘eco-dividends’? 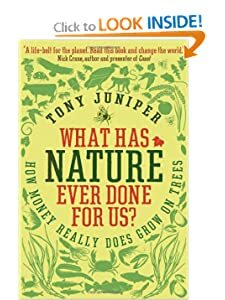 On page 278 of What Has Nature Ever Done For Us?, Tony cites the term ‘bio-economy’, which he describes as an integrated relationship between our ‘biosphere’ and our ‘buyo-sphere’ (clever!). In other words, a bio-economy is a fusion of our economy and ecology. Even if they never expressed it in so many words, the Hawaiian and Ecuadorian straw hat-makers have always known about the value of having a ‘bio-economy’. But for our modern culture to ‘regress’ towards this kind of ancient thinking, we must address the issue of our fundamental feelings of Disconnection. In the chapter on Collaboration in The 7 Graces of Marketing I talk about how Collaboration–not Competition–is our natural state of being. The ecosystem of which we are a part is an intricately woven tapestry of Collaboration. When you pull to hard on even just a single thread of that tapestry, the whole system starts to unravel. We will only ever ‘sort of’ understand ecological issues an intellectual level until we address the emotional issues underpinning our feelings of Disconnection from Nature. You and your business are not separate from Nature. Everything decision you make, every action you take, has an impact upon the greater ‘bio-economy’. If we are to become true ‘servant entrepreneurs’, we must first address our own emotional Connection to the Earth, and reflect how our work (including our business plans, pricing and marketing) are either contributing to the problems or creating the solutions for the future our world–both humanity and planet. INTERNAL: How would you describe your emotional Connection with Nature? How much attention do you give to this? How integrated is this Connection into the way you live and work? How does this Connection inform your professional line of work? ENERGY: Take some time out to assess your carbon footprint in the energy consumed your daily operations. How conscious of this have you been? How/where can you conserve energy? If you don’t know how to do this, do some research this week about carbon footprint companies in your area. EXPENSES/PURCHASES: Where have you opted to go for ‘cheap’ labour or products? What’s the bigger cost of these decisions? For example, how/when have these decisions caused you to buy things more frequently? Are there additional ‘hidden’ costs in this product (e.g., fuel required to transport it from distant locations; human costs owing to it being produced in factories where people are underpaid, etc.). How much do you know about the things you are buying? INCOME/ECONOMY: What is my company’s economic footprint? How is it distributing wealth to others? How much are you unconsciously operating in a linear economic model (i.e. believing you need to work towards an ever-increasing profit every year)? How are you supporting local economies through your spending, hiring, etc.? How are you contributing to non-profits, social enterprises, etc.? MARKETING: How may you be encouraging over-spending through your marketing? How do you bring consciousness of the importance of Connection to Nature in your marketing? How actively are you taking responsibility for increasing this awareness through your marketing? What has held you back? How can you change this? Juniper, Tony. 2013. What Has Nature Ever Done For Us? London: Profile Books. This entry was posted in Blog, Collaboration, Connection, Disconnection, Lynn Serafinn and tagged bioeconomics, capitalism, ecology, economics, Ecuador, Lynn Serafinn, marketing, modernisation, Panama Hats, social change, Spanish American War, sustainability, Teddy Roosevelt, Tony Juniper, urbanisation. Bookmark the permalink.